This year I decided to finally bite the bullet and build a conversion kit to switch my 2014 450 back and forth from dirt to street. I bought this bike new in 14 and it has been the best bike i've ever owned. When I started to build the setup I realized it was very hard to find good information on what setups worked and what didn't. I though I would share what worked for me and some pictures of how it turned out. It hard to find words to describe how fun this bike is now on the street. It is unreal how much fun this bike is in both setups now. Here are a few of the mods I had done previously. -The lower guide bolts have to be removed to install the tire. -The front brake line and speedo cable have to be secured to the fork guard to prevent it from rubbing the rim. I drilled a small hole and ran a zip tie. -I couldn't find a good aftermarket front fender so I ended up with a polisport fender I cut down. I layed out a shape very similar to the factory angles with a template so both sides match and trimmed with a jig saw. After it was cut I sanded the edges to give it a factory like curves and re-melted it with a propane lighter. It looks factory and really makes the front end. All in all it cost about $2k but it was worth every penny! Awesome!! yea I can't find much info either.. There used to be kits from Betausa that was readily available but there used to be a big front brake kit too etc. I have run across wheels in the past for sale used and like a dummy I didn't get them. I think I should have now. I'd like to have a set for my09 525 RS.. Your bike looks good!!!! I think there is one Super moto thread for Beta thread here.. maybe more but few lately.. look and see in case you might see something that might be a lead for your setup.. but doesn't look like it.. It looks good right now. Thanks for sharing!!! i have done the same thing to my 13 498, although i run the brake line hose on the outside of the fork guard, safer option i reckon, but i made a bracket to hold it off the guard and prevent it from rubbing on the fork leg. a dude at a track day the other week lost his front brake on a DRZ cause the disc cut through the brake line, so keep and eye on it, just in case. i'm really curious if that front disc is actually 320mm ??? or is it 300mm ??? i scored a set of 05 husky wheels cheap, put a beta 240mm disc on the rear hub, made some spacers for the front wheel. here is an old pic from last year, it's finished now with a new fender and some little mods. My WR450 wheels won't fit easily by any means though. Not sure about your Beta but on my YZs I use a flat socket head bolt and flip them to give me more clearance when mounting the wheel. I countwraink the guide a tiny bit so they are flush. 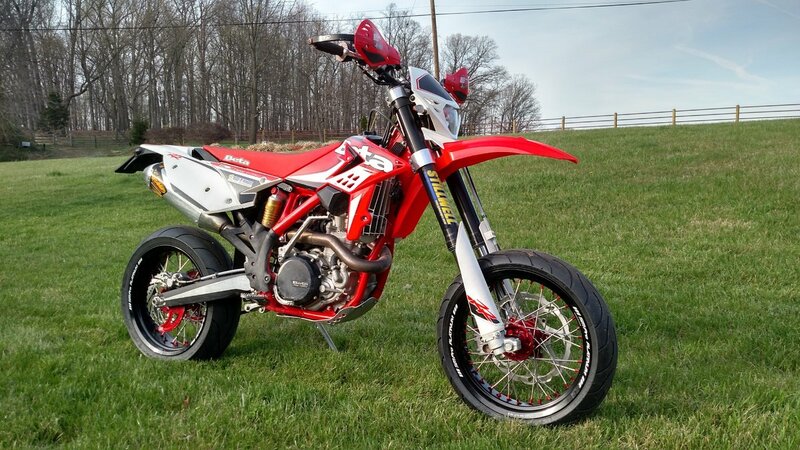 Own a 2011 450 RS Supermoto. Wanting to find/fit an over sized front rotor. Beta no longer sells the kit for my year. Beta USA suggest that I purchase a new/current front hub and new/current oversized rotor kit. Then, I would need to do some spacer machining. Sounds reasonable, if it works. A little bit of a $$ gamble, IMO. Dont think they would say 100% it would work on my RS forks. Advice is greatly appreciated! heres my 2017 430. i can swap out the rims in 30 minutes. Great job , what a beautiful bike ! I've seen a KTM 500 exc supermoto build on this channel : Supermofools , these dutch guys have transformed the bike from enduro to supermoto , with new wheels , forks , plastics and accessories , take a look , they have done the same on a husqy FE 501 .